According to a new market report published by Transparency Market Research, “Automotive AC Compressor Market - Global Industry Analysis, Size, Share, Growth, Trends, and Forecast, 2018–2026” is expected to reach US$ 32.39 Bn by 2026, expanding at a CAGR of more than 2% during the forecast period. 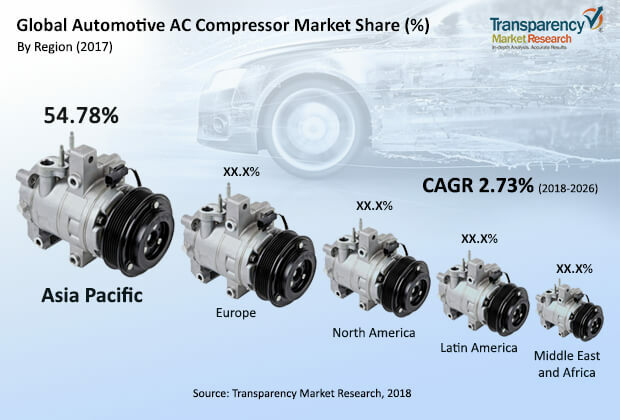 The global automotive AC compressor market is projected to expand at a CAGR of more than 2% between 2018 and 2026, according to a new research report by Transparency Market Research (TMR). According to the report, the global market is likely to be influenced by a range of political, economic, social, technical, and industry-specific factors. Latin America is expected to witness rapid rise in demand for AC compressors, and the market in the region is anticipated to expand at a CAGR of nearly 3% during the forecast period. Currently, global warming is a major issue that is affecting the lives of people. Temperature of the environment is increasing by one to two degrees every year. Transportation in such weather conditions is not easy. Vehicles are equipped with AC units in order to curtail these problems, which regulates the temperature of the vehicle interior. There are two broad segments of AC compressors: electrical and conventional. Convectional compressors directly run through the engine, via a belt, which exerts pressure on the engine, leading to increase in vehicle emission. Increase in vehicle emission leads to a rise in global warming, as vehicular emission has greenhouse gases such as CO2 and methane. Electric vehicles have been introduced in the market in order to deal with the issue of vehicle emission. For electric vehicles, an electrical AC compressor is used. An electrical AC compressor is also utilized in premium vehicles. Demand for premium vehicles has increased due to the increase in standard of living and purchasing power capacity. Furthermore, demand for zero emission vehicles is increasing in order to overcome the problem of deteriorating environmental conditions. The automotive AC compressor market can be segmented based on design type, drive type, sales channel, vehicle type, and region. In terms of design type, the automotive AC compressor market can be divided into reciprocating and rotary. The reciprocating segment can be further sub-divided into swash type and wobble type. Reciprocating type was a leading segment of the AC compressor market in 2017 due to the higher usage and easily availability of wobble type of AC compressors in all types of vehicles including hatchbacks and heavy commercial vehicles. Their effectiveness to work in normal conditions and low prices of its components make wobble type compressors highly preferable in countries of Asia Pacific, such as India and Indonesia, where vehicle production is significantly high. The scroll sub-segment of the rotary segment witnessed expansion at a higher growth rate, as compared to the other segments of the market, in terms of design type. Increase in usage of premium vehicles with better performance is driving the scroll sub-segment of the market. However, it is employed in several vehicles, in spite of being expensive, owing to its compact in size and low noise generation. In terms of revenue, the scroll-rotary sub-segment is expected to reach US$ 8 Bn by the end of 2026, expanding at a CAGR of more than 3% during the forecast period. In terms of drive type, the global AC compressor market can be bifurcated into electrical AC compressor and conventional AC compressor. The conventional AC compressor is directly driven by the vehicle engine through a pulley connected via the V-belt. These type of compressors exert considerable pressure on the engine, leading to higher fuel consumption. The conventional AC compressor segment held a prominent share of the market, and its share is likely to reach about 89% of the market by the end of 2026. The conventional segment dominated the market and is likely to hold a prominent share of the market by end of forecast period. Economy of sub-regions such as the Middle East and some parts of Asia Pacific strongly depend on fuels. Hence, in such sub-regions, the conventional IC engine is likely to be utilized in the near future. Therefore, the conventional segment of the market in Middle East & Africa is likely expand during the forecast period. Rising trend of electrification of vehicles is anticipated to drive the electric segment of the AC compressor market. Rising penetration of electric vehicles, due to offering of incentives, subsidies from governments in order to protect the environment, and developing infrastructure are anticipated to boost the electric AC compressor segment. The passenger vehicles segment held 76% share of the global market in 2017. Usage of AC compressors is directly related to the production of vehicles incorporated with AC units. Most passenger vehicles are already equipped with an AC unit, as it provides a comfortable cozy atmosphere inside the vehicles. Consumers buying vehicles for personal use highly prefer an AC unit for their vehicles. Passenger vehicles account for a higher share of the total vehicles used for personal purposes. Hence, the passenger vehicle segment held a higher share of the AC compressor market in 2017. Rise in the number of first-time buyers has boosted the sales of small vehicles in the global market, which in turn is propelling the automotive AC compressor market. The AC unit is mandatory in all commercial vehicles owing to government regulation and demand for vehicle safety. Therefore, the commercial vehicle segment is expanding at a rapid pace. The OEM segment led the market, and accounted for 76.27% share of the market, in terms of revenue, in 2017. The automotive AC compressor has a lifespan that is almost equal to that of the vehicle, i.e., 10 to 12 years. The AC compressor is replaced only when there is an issue in the AC unit, else it is likely to run for the entire life of the vehicle. Consequently, the replacement of an AC compressor is rare. Hence, the aftermarket segment holds a relatively minor share of the market. In terms of geography, the global automotive AC compressor market can be segregated into North America, Latin America, Europe, Asia Pacific, and Middle East & Africa. Asia Pacific held a major share of the global market in 2017. Increase in number of vehicle users due to huge population, increasing purchasing power, raising wages, and increased in standard of living are key factors that drive the market in Asia Pacific. Furthermore, prominent economies in Asia Pacific are demanding eco-friendly vehicles, and the rise in mass production methods such as assemble line production is likely to boost vehicle production in region. These are major factors driving the AC compressor market in Asia Pacific. Emergence of business affairs revised taxes during Brexit is expected to hamper sales and production of vehicles in Europe, which in turn is anticipated to hamper the AC compressor market. Optimization in size, advancements in methods used to manufacture AC compressors, development in materials that are utilized to manufacture automotive AC compressors, and advancements in design of AC compressors are fueling the technological growth of the automotive AC compressor. The global automotive AC compressor market is highly cohesive, as design and manufacturing of the automotive AC compressor requires considerably skilled workers, advanced technology, high precision, and high investment. Moreover, the market witnesses the presence of major manufacturers working in the industry for several years. Major share of the automotive AC compressor market is held by local manufacturers, as they are in large numbers. Major players operating in the global automotive AC compressor market include Behr Hella Service GmbH, Calsonic Kansei Corporation, Continental AG, Delphi Technologies, DENSO Corporation, Hanon Systems, Keihin Corporation, MAHLE GmbH, Michigan Automotive Compressor, Inc., Robert Bosch GmbH, SANDEN, Subros Limited, TD Automotive Compressor Georgia, Toyota Industries Corporation, and Valeo.